The World Cup - Tunisia V England! Get out your face paint and prep yourself for a few rounds of the Three Lions chant, the World Cup is almost here. For an entire month this Summer, from 14th June - 15th July we'll all be glued to the telly as we watch the best players in the world play some incredible football. The first game for England lands on the 18th June against Tunisia so we're getting planning our World Cup party to watch the first game we're playing and kick off the excitement! On theme, we're going for tasty food that's easy to eat and have limited prep time or can be prepared beforehand - with some games beginning at 6pm UK time, we know you'll be running home from work to get the game on so we don't want to make it too complicated! 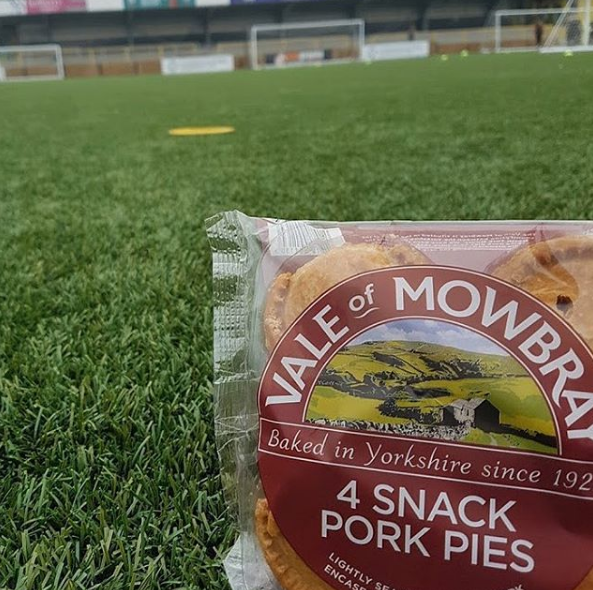 For the Tunisia V England game, we've gone for a pork pie (what's more British than a good pork pie?) to represent England and a Tunisian paste Harissa to compliment the pork pie. If you've not got much time, you could prep this the night before and store in an airtight container in the fridge until the game. You need to grill/ broil the red pepper on a very high heat. The method you use will be dependent on your oven. We move the oven rack up to the top of the oven and turn it on to broil – if your oven has options here, turn it up to a high heat. Place the red pepper under the broiler, it will take around 25 minutes but make sure you keep turning it. The outside of the pepper when it’s ready should be blackened and soft. Pop the blackened pepper in a deep bowl and cover it with cling film, leaving it to one side to cool. Once cooled, you need to peel the pepper and also de seed it inside. Make sure it’s completely cool before you do this or you might burn yourself. Whilst your pepper is cooking/cooling, you can be doing other prep at the same time. In a dry frying pan, gently toast the coriander, cumin and caraway seeds for around two minutes. Then, removing them from the heat, take a mortar and pestle and gently grind this to a powder. The three separate things you’ve just made now need to be popped into a food processor and whizz until smooth – add more olive oil if it’s too thick or if you just want a drizzle on top. If you spoon into an airtight jar, this will last up to 2 weeks, so you can definitely prepare before the game and serve as a condiment to the pork pies. With three England games already prepped, on the 18th June against Tunisia, the 24th June against Panama and the 28th June against Belgium, we’ve got some exciting Summer watching! Pair the Harissa with a pork pie – we’d go for a mini pork pie or mini pork and pickle – perhaps even a snack pork pie so that it’s easy to eat for everyone invited that will be distracted by cheering at the telly. There are of course, so many easy in front-of-the-TV accompaniments to pair with a pork pie, perhaps include a spread of condiments. You could also add a crowd favourite of some nachos with cheese and salsa – these always go down a treat and are a great snack to make at half time to help with the second half nerves! To drink with this simple pairing, we’d go for a simple craft beer or Corona. Not wanting to complicate football food but still wanting it to be yummy, we thought this combination would really compliment each other in flavours. Again, whilst Harissa is meant to be hot, it’s really easy to make less so just by altering the amount of chilies – you could even make a mild and a hot so that everyone’s happy! Enjoy the World Cup – who will you be cheering for?